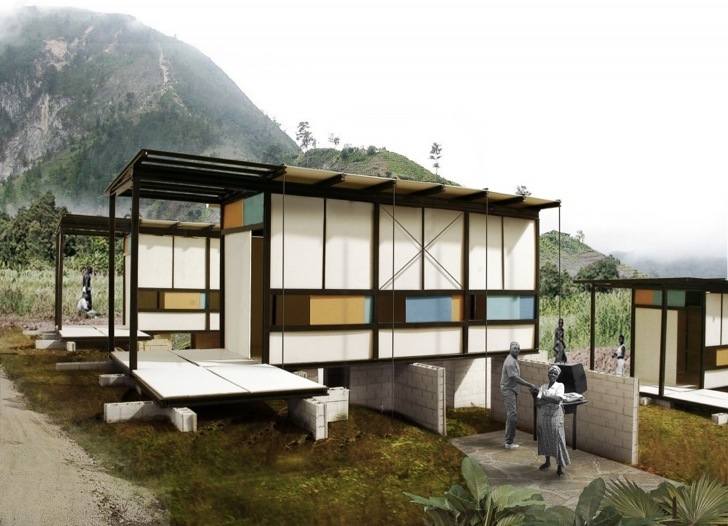 Proposed by Miami-based NC-office, these adorable L-shaped homes designed specifically for Haiti are completely self-sustaining. 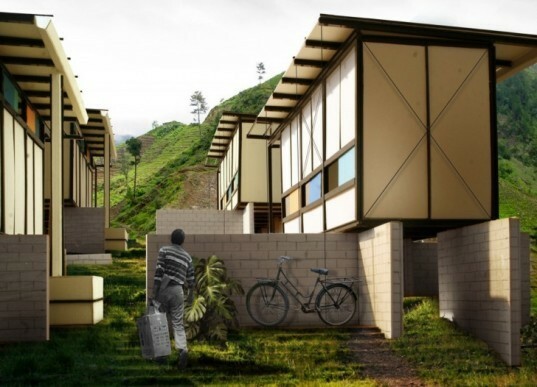 The thoughtful design was one of the standouts amongst a host of ideas that have been put forth to provide shelter to those people displaced by last year's devastating earthquake, including earthships, shipping containers and other prefabricated solutions. In addition to incorporating sustainable materials and passive design, the quaint homes offer solar paneling, rainwater collection, and self-compositing toilets. The small 8×8 modules consist of four rooms that form an L-shape. This allows the buildings to interlock repeatedly while also allowing for a small private garden. But the real beauty is that they are completely self-sustaining. A solar panel creates 1kW of clean energy, a cistern harvests rainwater, and the toilets are self-composting. There is no glass in the design. Instead, the outer skin is made from magnum-board panels and the entrance is comprised of solid sliding panels and mosquito nets. Despite their size, the homes can withstand both wind and earthquake loads. The utilities are situated in one area to reduce plumbing and electrical conduits, and the home completely conforms to the surrounding landscape. At low cost, these attractive homes are an excellent antidote to disaster. The L-shaped homes are completely self-sustaining. The homes can interlock to create a village of homes that also have a small private garden. The modules are made up for four 8x8 rooms. The modules are designed to conform to the surrounding topography. A solar panel provides 1kW of clean energy, and a cistern harvests rainwater. Also included in the design are self-composting toilets!